Summertime snacking just got a whole lot easier thanks to the makers of the WHOLLY GUACAMOLE® brand, America’s #1 selling refrigerated guacamole. Today, the company debuted a new line of portable Snack Cups featuring its signature guacamole made from hand-scooped Hass avocados. They are the perfect grab-and-go option for lunch boxes, picnic baskets or beach bags, allowing anyone to guac and go with ease. Stemming from a desire to bring all of the goodness and flavor of WHOLLY GUACAMOLE® products to a more portable package, these perfectly portioned Snack Cups are available in two flavor-packed varieties—Classic (Mild) and Spicy (Hot)—and conveniently paired with just the right amount of crunchy tortilla rounds. Hitting retailers nationwide for the first time this month, this great tasting, gluten-free snack gives the whole family a new way to enjoy the WHOLLY GUACAMOLE® brand they know and love. Featuring only high-quality ingredients with no preservatives or artificial flavors added, the new 2.8-ounce WHOLLY GUACAMOLE® Snack Cups (SRP $1.99 – $2.79) are available at Walmart stores in the produce section and select convenience stores nationwide. 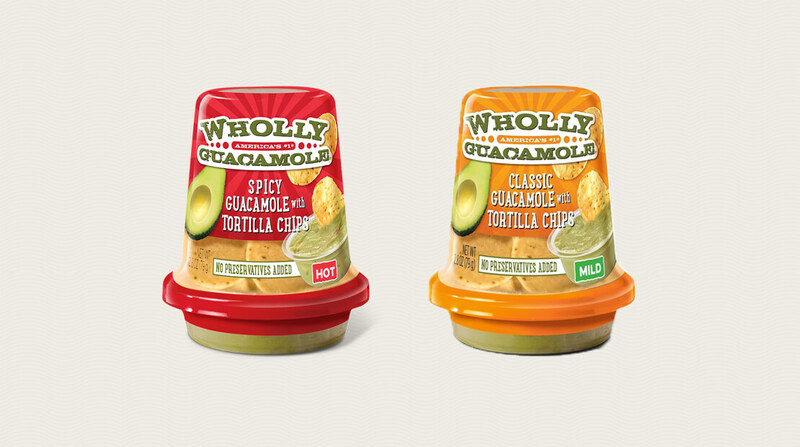 For more information or to learn more about WHOLLY GUACAMOLE® products, visit www.eatwholly.com. The WHOLLY GUACAMOLE® Brand is a brand of MegaMex Foods, one of the largest manufacturers of pre-prepared Mexican food across the country. A global leader in food safety, quality and innovation, the WHOLLY GUACAMOLE® Brand uses High Pressure Processing (HPP) to create WHOLLY® products. In addition, each product is made with hand-scooped Hass avocados and is gluten free and kosher certified. All WHOLLY GUACAMOLE® products are available nationwide in the produce or deli section of grocery stores. For more information, visit www.eatwholly.com.